Soy — Super Bean or Super Threat? Soy truly seems to be a wonder food. It's an excellent source of dietary fiber and protein. It is rich in vitamin B6 — important in building amino acids and in the formation of neurotransmitters. Furthermore, soy is often recommended as an alternative for meat in low-fat diets. Soy's greatest advantage may lie in it being a rich source of isoflavones — plant hormones that have been linked to several health benefits. For example, researchers believe a soy-based diet could account for Asia's low rate of heart disease. The leading cause of death in the United States, one of the risk factors for coronary heart disease is high levels of LDL or "bad" cholesterol. In recent clinical trials, men and women with high LDL levels were able to reduce them by consuming soy over an extended period. In 2007, the FDA (Food and Drug Administration) announced that certain foods containing soy will be able to claim that they may help reduce the risk of coronary heart disease (to qualify, the food must contain at least 6.25 grams of soy per serving, one-quarter of the daily recommended serving of 25 grams). And that's not all. It is possible that isoflavones may help prevent bone loss, therefore lowering the risk of osteoporosis. A soy diet may also play a role in the reduced incidence of menopausal symptoms among Asian women. In fact, it is thought that plant hormones will eventually take the place of conventional estrogen-replacement therapy. Finally, isoflavones have been credited with reducing the rates of certain types of cancer. For example, there is some evidence that eating soy may reduce your risk of developing breast cancer. And isoflavones were the primary ingredients in a "smart bomb" — a drug that University of Minnesota scientists believe holds the potential to cure childhood leukemia. 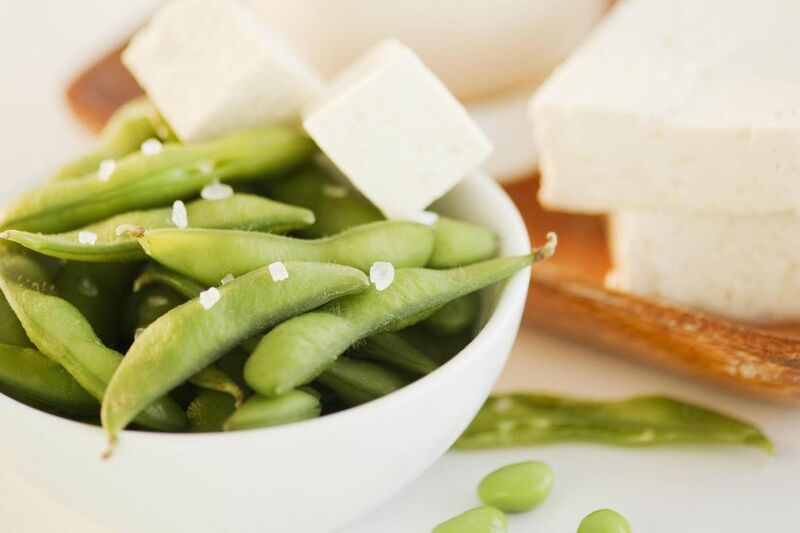 Finally, a study by the Cancer Research Center of Hawaii indicates that consumption of soy products may help reduce the risk of uterine cancer. So why aren't westerners pouring soy milk in their cornflakes and chowing down on soy burgers at the local fast-food restaurant? Soy still suffers from a bit of an image problem in the west. A common complaint by first-time users is that it just tastes too "beany." Still, manufacturers believe a soy revolution is coming. Soy-based yogurt, pudding, and hot dogs may soon compete with soy burgers for space on grocery shelves. But while food manufacturers want to turn us on to soy, others feel the pro-soy movement is ignoring a host of health problems. Allergies, for example. Soy is one of eight foods responsible for the majority of food allergies, and one of five foods most commonly associated with food allergies in children. People with a soy allergy can suffer everything from hives and diarrhea to breathing difficulties upon eating this food. Furthermore. just as some people have lactose intolerance, there are others who have a soy intolerance (While food allergies involve the immune system, food intolerance is caused by an enzyme deficiency). Are There Proven Negative Effects of Soy? In recent years, soy's detractors have made other claims that are both more serious and harder to prove. For example, a groundbreaking study by the Pacific Health Research Institute links high levels of tofu consumption with cognitive impairment and the development of Alzheimer's disease in later life. There is increasing concern that eating large amounts of soy can affect thyroid function. Particularly worrisome is the presence of phytoestrogens in soy-based infant formulas (isoflavones are a category of phytoestrogen). Critics point out that the level of phytoestrogens in the soy-based formula is over 20,000 times that found in breast milk. In a 1999 press release, the Canadian Health Coalition stated that consumption of soy formulas could lead to a host of health problems, including thyroid dysfunction. They called on then-federal Health Minister Allan Rock to impose restrictions on the use of soy-based infant formulas. There has also been concern over whether or not soy consumption can have an impact on thyroid function in adults. Super bean or super threat? Should you swear off tofu and throw out the soy sauce? No, for one thing, the amount of soy contained in soy sauce is comparatively low, since it consists mainly of water. More to the point, the real problem is not whether soy is inherently bad (after all, people have been consuming plants with hormones for centuries) but that no one is sure how much soy it is safe to consume. While Asians have been consuming soy for centuries, there have been conflicting claims about how much soy they consume. Nonetheless, if soy starts turning up in everything from cereal to ice cream, we may begin consuming far higher amounts than is normally found in the Asian diet, without any real idea of the consequences. A related issue is that modern preparation methods for soy products may increase health risks. For example, some companies use chemical hydrolyzation instead of traditional fermentation methods to make soy sauce. It's something to think about. Is Sun Tea as Healthy as Brewed Green Tea? How Much Green Tea Should You Drink for Maximum Health Benefits? What Are the "Five Elements" of Chinese Cooking?